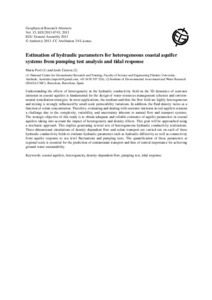 Pool, M.; Carrera, J. Estimation of hydraulic parameters for heterogeneous coastal aquifer systems from pumping test analysis and tidal response. A: European Geosciences Union General Assembly. "European Geosciences Union General Assembly 2013 - Abstracts". Viena: 2013, p. 1.